Wild winter weather keeping you cooped up inside? Cabin fever got you down? You're not alone. 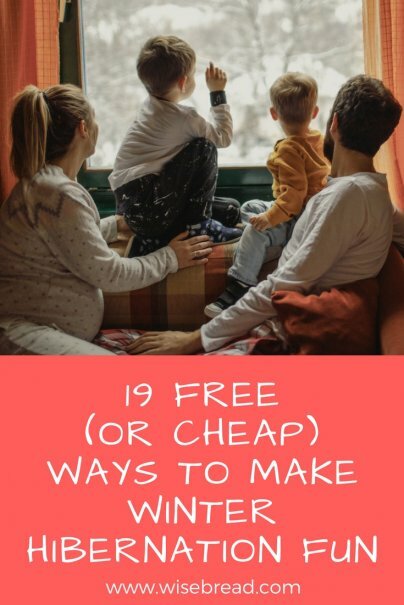 Send your stuck-in-the-house blues packin' with these cheap or free ways to have fun indoors while Mother Nature does her thing. My boyfriend and I love cooking at home together, but we also love junk food, which is why our recent chicken wings and cookie cook-off was such a fun success. With our new air fryer, wings are easier than ever to make (seriously, this appliance has changed our lives! ), and the cookies were a sweet juxtaposition to all that salt and spice. Every year before the Academy Awards, I attend the Best Picture Showcase hosted by AMC theaters, which screens all the nominated films during two full-day Saturday screenings, or one marathon 24-hour screening that shows the nominees back-to-back. But you don't even need to step outside in order to catch some of this year's nominated films. Check to see which films are available to rent on-demand and have your own movie marathon from your couch or bed. And don't forget the candy and popcorn! It's a relaxing way to catch up on award-worthy flicks without having to brave the elements. My dog Jaxon loves his life at the beach, especially during the warmer months when we go to the outdoor doggy happy hour to hang out and roll around in the sand. He misses that in the wintertime, which makes right now the perfect time to invite some of his furry friends over for a play date. It's a win-win for both of us; he gets to roughhouse with his pals, and I get to day drink with my buddies. Fortify your New Year's resolutions with a vision board that helps you "see" your goals on a regular basis while you think about how to achieve them. Use your old magazines and newspapers as source material. You don't have to go far to experience something exciting and new. It doesn't have to be expensive, either. Hop online to plan a local getaway filled with low- or no-cost activities like hiking, biking, open-mic nights, bingo, and bar trivia. During a blizzard a couple years ago, I ventured outside in all my snow gear and made my way to the downtown area for brunch and drinks. I ran into friends along the way, helped a few folks get their vehicles out of precarious positions, and got in a pretty good workout from all the treacherous ground I covered. It was honestly one of my best winter memories to date. Tuck the corners of your extra flat sheets from one drawer to another around your room and act like a kid again. Make the covered space cozier with pillows, blankets, your favorite person, snacks, and devices to keep you two entertained. Gather a few pinecones, slather them with peanut butter, and roll in birdseed before hanging from your porch or trees. Watch all the beautiful birds — like colorful cardinals and jays — stop by for lunch. I have several appliances that don't get as much use as they should, like my popcorn and waffle makers, which makes a hibernation day the perfect time for a popcorn and waffle party. Repositioning your furniture can give your place a whole new look and feel. Switch things up while you have some time on your hands. Shopping is definitely one of my favorite pastimes. And there are lots of great sales this time of year, including post-Christmas and winter clearance, and President's Day (which is one of the best shopping weekends of the year, by the way). My boyfriend and I just went on an incredible trip to Colorado Springs. So much nature and adventure at every turn (I recommend getting out there if you have the opportunity; you won't regret it), and we have lots of photos of the memories we made, which is the perfect starter material for a scrapbook. Of course, you don't have to go anywhere to start a scrapbook of your own. You probably have photos and mementos of past vacations and special occasions lying around the house right now that you can use to start your own scrapbooking project. Plus, Valentine's Day is coming up, and this would make a thoughtful gift.